One of six parallel conferences running at the National FutureSchools Expo. 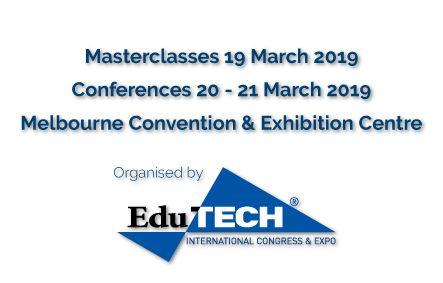 A practical conference designed for coalface educators wanting to integrate emerging technologies into their classroom (including coding, robotics, drones, 3D printing, wearables, augmented reality, gaming and other disruptive technologies), and ICT managers wanting to support these technologies. Classrooms are awash with unprecedented amounts of technology…..and more's on the way. Early adopters are already finding classroom applications for emerging tech such as 3D printers, laser cutters, drones, robotics, games-based learning platforms wearable technologies and augmented reality. How can we leverage technology to enrich and deepen learning experiences, all the while meeting curriculum outcomes, keeping school communities safe and productive, and without blowing the budget? Are you ready for a ClassTECH revolution? Attendance at National FutureSchools Expo counts towards PD/professional learning activities which you can record with your relevant state teacher registration board.